300 windy days, flat water, awesome weather. Yes, kiteboarding heaven! Here is your guide to the best kiteboarding spots in Lo Stagnone! Ahhh, Sicily; the half eaten pizza like shaped island on the south-west of Italy’s “boot”. A place most notoriously known for its rugged coastline, smooth olive oil, mafia and of course that iconic scene from The Godfather. But did you know it is also home to one of the biggest & windiest lagoons in the whole of Europe? So, as Italians are so into their food, let me put it into the simple foody terms and give you the perfect recipe for the real connoisseurs. Take a Mediterranean amount of 23°C water and a pinch of salt-flat. Add rich, historical culture, drool-worthy dining and a floral essence from the nature reserve. Add Sicilian wine. Then, using a micro-climate worth of wind, consistently whirl for more than 300 days a year. Spread around 4 private, protected islands and bake in the warm sunshine. This is your delicious, Sicilian cake. Otherwise known as Lo Stagnone of Marsala. Ohmmm. This spot can be found on the west point of Sicily, just a hop, skip and jump (3km) away from Trapani airport, so there really is no holding you back. 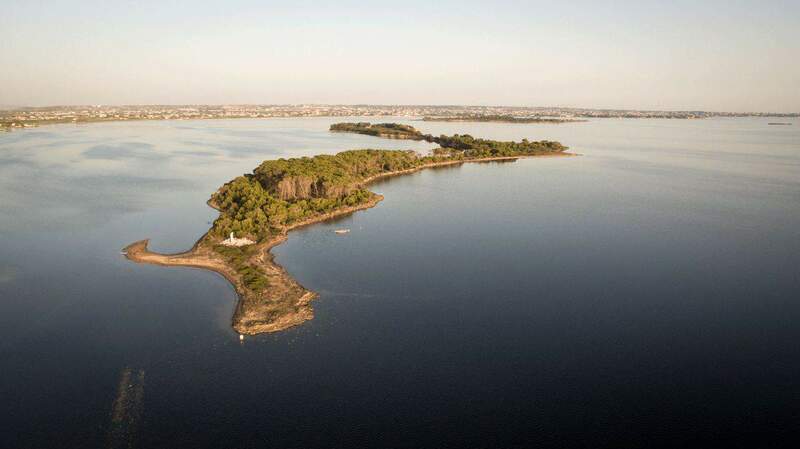 The Stagnone Nature Reserve, as Wiki calls it officially, is set across a great big lagoon that is surrounded by 4 isolated protected islands; Isola Grande, San Pantaleo, Santa Maria and La Schola. The lagoon is perfectly wedged between these four islands and Sicily’s mainland, creating a natural wind tunnel … a sort of independent “micro-climate”, just a perfect environment for a progressing kitesurfer! Whatever you’re experience level is, there is plenty to keep you entertained. The wind here blows consistently all year long from all directions, but the best and probably the most reliable time of the year to rock up would be anywhere from mid March all the way up to the end of October. April to September is the main season when the wind tends to get much stronger. Summer months are perfectly warm, creating a thermic wind best suited for smaller to medium sized kites. It could get a bit gusty closer to the shore, but once you pass that, you’ll get a good stable wind, perfect in all directions. Because of its unique positioning, the lagoon actually makes it one of the very few spots in Europe that offers reliable wind also through the winter months. The water obviously gets much cooler in winter, so pack a big kite and a thicker wetsuit, you’ll use it. The town, hotels and kite schools awaken, opening March to November. Summer months can get busy with the warmer climates, but it never feels crowded - the lagoon is a sizeable area so once you launch, you can isolate yourself fairly easily. So where to rig up? If you’re staying with one of the kiteboarding schools around Birgi Vecchi just in the main bit in front of the lagoon, you can use their bigger launching and landing area. That’s really helpful especially for the beginners. Otherwise pumping up your kite and finding a good launching spot could get a bit tricky although there are other smaller beaches to launch from. There are 5 main kitespots in Lo Stagnone favoured by the locals and the local kiteschools. Salina Wall at Isola Grande - It actually takes a bit of an effort to ride up to this kitespot, but it totally pays off at the end. Salina Wall is located on the west side of the lagoon, just next to Isola Grande. The north-west and west direction wind is very steady here and the water just perfectly butter flat due to the position of the old Salina Wall just in the middle. Water here is deep enough to pull a few tricks. Isola La Scuola - "La Schola" in Sicilian or "The School" in good old English, is tiny island called poking out of the sea in the south-west part of the lagoon. It is easiest to get to with the north-west wind. There is a small ancient marina and a few other ruins on the island. There was once a school of rhetoric during the Roman times. That's where the island got its name, ‘The School’, but it is also believed that this is where Cicero taught at the time when he was the quaestor of the Lilybaion city, the old Marsala city. And long after, during the Second World War, a few more building were added and the island converted into a hospital for infectious patients. Creepy! So there you go, if you're up for a bit of sightseeing while flying around, but there’s not much that’s left to see unfortunately. Salina Wall at San Theodoro on the north side of the lagoon. This place is really magical. The water is flat, knee-to-hip-deep, with the sea grass coming through, touching the surface and creating glassy mirror effect. I am talking glassy-I-can-see-my-face-all-the-time glassy. This spot is best to check out with the north winds. San Theodoro - on the tip of the lagoon. This is a super nice spot with crystal clear azure waters and white sandy beach. And you guessed it, since this place has its ‘Caribbean’ look, it does get a bit crowded with the tourists leaving you literally no space to launch and land. Worth checking out with north or south wind. Isola Santa Maria - In the middle of the lagoon you'll find quite a long stretch of land looking kinda like a rabbit foot. It is the long Santa Maria Island. While many kiters usually keep inside the lagoon making it pretty busy during the windy days, surprisingly not many people venture behind the island. Definitely worth the trip on a good windy day, you'll realise that you have that spot totally for yourself. No issues to get there on any wind, but best with north or south wind. Don’t expect blue lagoons! Lo Stagnone is not that kind of lagoon. The bottom of the lagoon is a mixture of mud, sand and sea grass, so the water here gets pretty murky. As you get closer to the shore, there are little stones and rocks poking out of the water. The entire lagoon is really shallow. I’m talking just about a meter deep max and not even up to the knee at some spots. So while this could be an awesome playground for the beginners or pulling off a trick or two, there could also be a great risk of injuries, so do watch out and get familiar with the area. You don’t want to break a bone jumping out high and landing in the shallows. As the lagoon is isolated from the sea and its waters are warm and shallow, it also attracts a few little creatures living in the sea grass including a jellyfish. Although you don’t need to worry as these little guys are totally harmless in this part of the world, but they can still deliver a painful burn, so if you have a sensitive skin, just pack a rashie. Don’t expect golden sand beaches! The beach is a bit of a combo of grass, sand and stones. And it’s not exactly the cleanest either. On a good day, the area gets quite busy, so finding a good place to pump up could be a struggle unless you’re with one of the kite centres around and using their turf. So you may need to walk around a bit before you rig up. Pack in a pair of booties to keep your toes safe and watch out so you don’t rip your kite dragging it through the beach! Capo Feto - this is for the days when you need a little change or for those who were expecting the blue lagoon. If you’ve ended up in a pickle with all the gear but the weather had no idea, then don’t panic… there is always a plan B! For those times you are unable to clip-in, why not saddle-up instead. Ditch the board for a bike and take to the rugged roads of Italy. Either head to the culturally rich medieval village of Erice or explore the depths of the natural reserve - either way, plan B isn't looking too bad now, huh! And if sitting on a bike and riding up hills isn't quite your thing then sit on a boat instead. A bit more relaxing, that’s for sure! Head further west (yes, further west) to one of the most western spots of Sicily… Favignana. 7km by boat from Trapani port, Favignana is the largest of five Aegadian Islands that are isolated out in the Mediterranean Sea. Mountainous and rugged, the water here is crystal blue, there are too many cute hidden bays to count, and when you’re tired, go find a shaded spot in one of the old fisherman towns. Most activities around Siciliy are nature filled so it would be silly to mistake Marsala for a party town. It really isn’t! What it is, is a great place to learn how to progress your kitesurfing in safe, flat and uncrowded waters. It is an absolutely fab fly-in-fly-out-scratch-that-itch kind of spot! How about venturing elsewhere? How about UK? Totally different cuppa, but you'd love it! Checkout some of the best spots for kiteboarding in Weymouth & Portland Harbour.